Ralph Matson was appointed Utah Symphony Concertmaster in 1985. He began his violin studies in Detroit with Emily Mutter Austin. Mr. Matson received a Bachelor of Arts degree from Yale College and a master's degree from the Yale School of Music. His principal teachers were Joseph Silverstein and Steven Staryk. He was a member of the Cleveland Orchestra, and prior to his Utah Symphony appointment, was Assistant Concertmaster of the Minnesota Orchestra. Mr. Matson's solo appearances with the Minnesota Orchestra and the Utah Symphony include collaborations with Stanislaw Skrowaczewski, Leonard Slatkin, Sir Neville Marriner, Eiji Oue, Joseph Silverstein, Keith Lockhart, and Pavel Kogan. 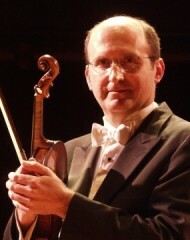 Since 1996, he has participated in the Grand Teton Music Festival where he is Concertmaster of the Festival Orchestra.